The Riverside Art Museum is exhibiting Some of Danna's Alexandria Lights, lamp work and crystal glass pieces in their store. The Alexandria Lights line showcases the beautiful glass beads of Lisa Kan. Send an E-Mail Dana has pieces from her line of Thai Silver on exhibit in the bookstore of the Claremont Museum of Art. Come by and see her special jewelry. Cabot's Pueblo Museum is exibiting Dana's unique jewelry. Cabot's Trading Post & Art Gallery are open every day with great art and gifts available for purchase. Museum tours are available by appointment. For reservations for tours, please call 760-329-7610. Guided tours of the Pueblo cost $8.00 for adults and $6.00 for Seniors, Students, Military Personnel and DHS Residents. Phone 760-328-7110 Imagine Gifts, in the Pavilion’s Shopping Center in Rancho Mirage features Dana’s everyday TDC jewelry line. Dana and her partner Diana March Enscoe of Jewels of the Earth have created the sumptuous Aurora line that is sure to charm Imagines’ customers. Dana is exhibiting a few select pieces from The Dana Collection at the Pasadena Gold Company. The Dana Collection is TDC Designs top design collection. It is designed for collectors of discriminating taste. I think that you customers will find the designs sumptuous, the colors rich and the texture soft and subtle. Below are two of the pieces on display at the Pasadena Gold Company. 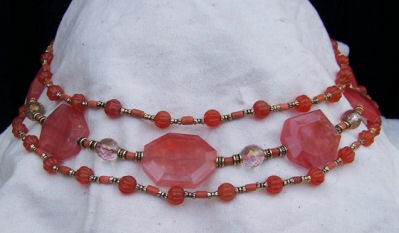 Cherry Quartz, coral and carnelian three strand necklace. 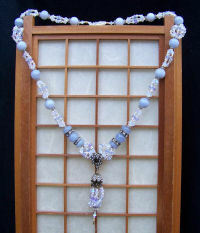 Opal, blue lace agate, Swarovski crystal necklace with rhinestone and enamel pendent. TDC Designs was a proud to be an exhibitor at the second annual Artisan’s Market. The market is a juried show open to the public. Dana teaches entry level bead stringing and earring design at Scripps College's popular summer alumnae program. Arroyo Arts Collection Dana's designs were showcased at the 14th annual Arroyo Arts Collection Tour. Eye on the Desert will air an interview with the principles of the Cabot's Pueblo Museum and show the artwork of five or six or the show participants this weekend on Channel 2 on Saturday at 6:30 pm and Sunday at 5:00 pm. They filmed the jewelry with Dana standing right next to it. KNews Radio “Joey is a vibrant, vivacious and charming personality with an infectious spirit,” states Dana about her interview with Joey English at KNews radio. Joey interviewed three jewelry artists for her once-a-month Fashion segment airing each week-end KNews show, on November 16, 2008. Rancho Mirage, CA 92270 Desert Art Source sponsored a special artist event “Autumn at the Hacienda” in Rancho Mirage, on December 7, 2008. The wonderful works of 28 artists, including Dana’s sumptuous jewelry, were part of an art fair at the historic private estate of Dr. Susan Rubini and Jeff Abbott. Proceeds from the event benefited Cabot’s Pueblo Museum where Dana is the featured jewelry artist. The show was wonderful and a terrific time was had by all. San Jose, CA What fun. This was Mirian Podich's first show. Our jewelry lines truly complimented each other. We will definitely be showing together in the future. Pasadena, CA The Pasadena ARTWalk at the Playhouse District was a blast! Kudos to the Playhouse District staff and the Pasadena Society of Artists for putting on such a great event. The show was top quality and meticulously organized. The customer's and I had so much fun trying on jewelry and talking about art. The day was beautiful, the music delightful and the exhibitors were simply awesome. Look for me next year, same time, same place.